But unlike numerous other large international airports, they are nowhere to be found beyond security, apparently because airport officials believe most travellers don’t need them. “Many passengers check their luggage before going through security,” Pearson spokeswoman Corrinne Madden said. Pearson’s management of baggage carts has long been an annoyance to the public. That’s because to use the carts you have to fork over $2, also a rarity among airports. “You have to pay for a baggage trolley, perhaps the most uncivilized aspect of the whole experience,” said one person in an airline consulting firm’s online forum. Comments on Trip Advisor also complained about the charge. 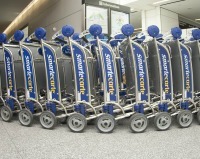 As for no carts at all in secured areas that “varies from airport to airport,” Madden said. But there may be light at the end of the concourse.